I sell high quality raw honey, chemical free, and strained but not finely filtered. You can see and taste the difference! The creamy texture and flavor and of this raw Idaho honey comes from isolated, pesticide free areas in the foothills in and around Boise. We minimally process to maintain the natural pollens, enzymes, and the unheated, unfiltered flavor of this premium honey. I have delicious raw local honey available. My bees are managed with organic methods, the honey is raw and contains local pollen. For $10 you get a 16 oz bottle. I have other random sizes clearly marked. The Honey Hut is located by the mail box, and you will need exact change, as in you fold up the bill, poke it through the hole, and help yourself. 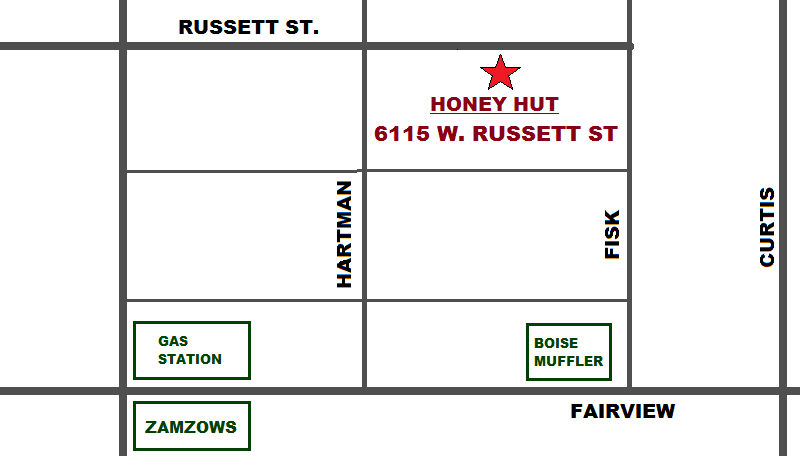 No need to plan a meet up time, just swing by at your convenience and get fresh honey. Raw honey is the concentrated nectar of flowers that comes straight from the extractor; it is the only pure, unpasteurized, unprocessed honey. Raw honey is the healthiest choice amongst the various forms of honey as it has the most nutritional value. Most of the honey found in the supermarket is not raw honey but "commercial" regular honey, which has been pasteurized (heated at 160 degrees or more, followed by rapid cooling) and filtered so that it looks cleaner and smoother, more appealing on the shelf, and easier to handle and package. On the downside, when honey is heated, its delicate aromas, yeast and enzymes which are responsible for activating vitamins and minerals in the body system are destroyed. Hence, raw honey is assumed to be more nutritious than honey that has undergone heat treatment. Characterised by fine textured crystals, raw honey looks milkier and contains particles and flecks made of bee pollen, and honeycomb bits. Raw and unfiltered honey is relatively low in moisture content (14% to 18%) and has a high antioxidant level. It also has more flavor.